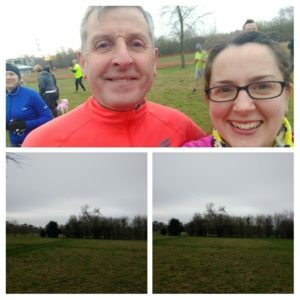 So the original plan for this Saturday was to meet my dad at Heartwood forest parkrun, run there together and then go back to theirs for breakfast. Last week however, our plans were scuppered when Heartwood forest announced that it would be closed until the spring to allow the paths to recover. As we had already pencilled in a trip somewhere other than the regular places, I had a little look around. Letchworth was starting today, but they had requested a small launch so we will visit later in the year (I need it for the Queen of Herts title!). 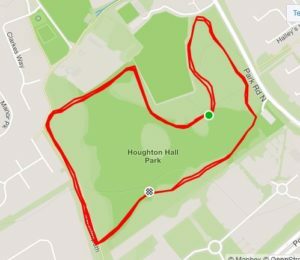 I’d seen a few people on Strava run at Houghton Hall, which is located close to Dunstable (so basically very close to the M1)- it would be around a 25 min drive from my parents home. I’d also seen it on the fab blog, blog7t, and realised that the reason why I hadn’t heard of it before was that it only started in December. It was two laps (well, two and a bit) which is always good in our book- and the route looked flat, on paths (not muddy)- winning all around. So I was up early on Saturday so I could pick up Dad on the way- I was treated to a beautiful sunrise- it was even more pink and purple than it looks. Anyway, the journey was very easy, although the postcode that we used took us to a little industrial park that backs onto the actual park (some other runners/ people in high viz clothes also made the same mistake as us)- easily solved as I looked at google maps and so we were parked at 8.35am. The car park was fairly small (as I had read on the blog) and although there were plenty of spaces when we arrived, when we left it was full, with people having made up spaces too. It was so cold though- I’d had to scrape ice from my car before leaving, and thankfully made a last minute decision to bring an extra layer, so we sat in the car until ten to. The park was lovely- very flat with fields and trees, plus a wooded area. The wind was whipping across the park during the new runners briefing and we were so cold- we did a start line selfie instead of the usual finish line one so we didn’t need to hang about at the end! The lady in the blue top then came over to apologise for photo-bombing us! I don’t think she really did but it was funny. I also chatted briefly to another cow-cowl wearer who came from High Wycombe- one we haven’t been to yet, but apparently is very flat and an out and back (no laps!) so that’s been added to the list too! After the main briefing, everyone walked a very short (10m?) distance to the start, where suddenly we realised we were off! The route went through the fields (on hard paths- a bit like compacted gravel maybe? ), briefly out of the park and up a sort of alleyway (a tarmac pedestrian path that backed onto gardens) and then back into the park. We seemed to pass the finish line very quickly, and then we knew we had two full laps to go. There was a tarpaulin for jumpers etc., they had said we could throw them on our way past, but it was way too cold and I kept my extra layer on the whole time. After running close to the start, we then headed off into a lovely woodland section (but again, very dry underfoot) before passing through the start again. I really enjoyed it- we ran at a fair pace to try and keep warm, but did manage to chat most of the way and ended up talking to a guy as we neared the end- this was now his local but he used to run at Luton and then Hemel- he’d been to a lot of the Herts ones so we compared notes. The poor marshals looked freezing though- one in particular was jumping up and down- the third time we saw her she told us she’d managed to warm up! The little alleyway bit was a slight uphill slope- the first time it seemed flat, the second time felt a bit uphill and the third time was harder but at least the end was nearly in sight. Dad had more speed left in him, so sped off and managed to finish 9 placed ahead of me in the end. I was quite pleased with my finish- I think I am usually about half way through the tokens (e.g. 80/160 runners) but this time I was 77/196, only 12th lady, with 27.38. Any finish with 27 at the start is a fast time for me, and this was flat (and no mud) so it felt good to run comfortably at that pace. We didn’t hang around- on the walk back to the car I saw this cool climbing wall made of old tree trunks- there seemed to be lots of things like that all around the park. We did do some stretches before getting back in the car though- then it was home to Mum and Dad’s for a quick shower and then pancakes- how all weekends should begin! One I would happily run again anyway- nice and flat, pretty scenery (and if you were touring, very close to the M1 and there is a big Travelodge right by the M1 junction). Do you chat to other people at parkrun? 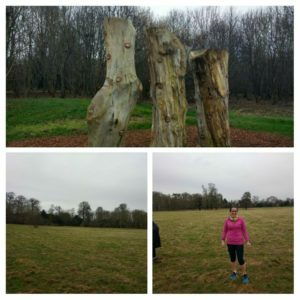 I am not really very outgoing with people I don’t know, but I find at parkrun people are always so friendly and there is always lots of common ground to talk about. I agree. Speaking to people you don’t know is hard, but at parkrun it comes very easily thanks to the shared bond of running. I chat to lots of people at parkrun. When we moved 250 miles I needed a way to get to know people and volunteering at parkrun was it. I know a lot of regulars now but also love chatting to newbies and tourists. It’s great that they are ready made communities for everyone to join- like you say when moving to somewhere new it’s a great place to start to get to know people. 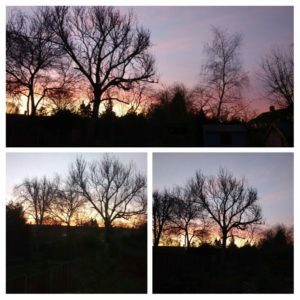 Hi Maria, I stumbled on your blog reading some other running blogs and thought I’d say hi. I do chat at parkrun, especially if (as at the moment) I’m recovering from an injury that means taking runs slowly! CT.